With monthly Miru lenses you will enjoy a comfortable and healthy vision. 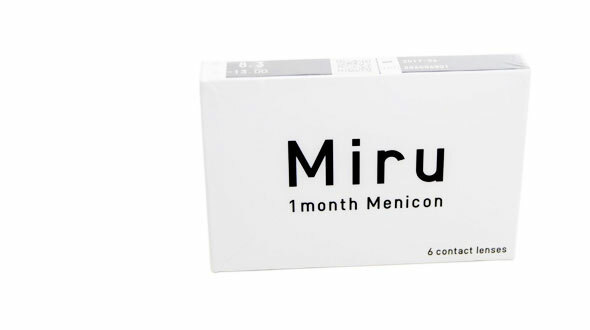 Miru is an online brand lenses, manufactured by Menicon laboratories and distributed in Spain by the visionis group. Miru are contact lenses made from hydrogel material nonionic silicone with low water content and can use it all day, with a level of comfort like never would have thought in a contact lens. • The cheap lenses Miru feature an advanced polymerization system called Menisilk, a hydrophilic monomer art, which provides contact lenses hydration, high oxygen transmission to the cornea of the user and full transparency, increasing performance, making your eyes breathe and be hydrated. • Miru takes an innovative surface treatment called Nanogloss, smoothing, preventing adherence of deposits on the lenses(lenses clean, better view) and improving wetting, which makes them more comfortable to wear. • Another very important feature with these lenses Miru is having an angle smaller corneal contact lenses other silicone hydrogel, which induces keep the lens hydrated surface and the patient has no sensation of dry eye. • The transmissibility of this lens is very high, even in the thicker areas, so it is a very safe lens, can take many hours without causing lack of oxygen to the cornea. • As for handling we say it is very easy, because its modulus of elasticity is very balanced, is not so high as to be uncomfortable but enough to not deform on the finger and is easy to handle. Also they include a handling tint lavender, which makes them more visible. • Its geometry provides: two radii of curvature, 8.30 mm and 8.60 mm, this data expands the number of patients who can access them. In addition, its power to -13.00 diopters myopia covers and +6.00 diopters of farsightedness. • Finally we say that has a design edge that remains constant, designed to improve the comfort of these online contact lens in the eye. In Prodevisión have all original brands. If you do not find your cheap lenses between our brands, please contact us at the email address or phone info@prodevision.com 968,908,108, our eye care will indicate the equivalent to the original brand, this way, you will ensure that the lenses that you will ask are the same as usually use. In Prodevisión you can buy cheap Miru lenses quickly and with secure payment.